A Croatian immigrant arrives in this country shortly before World War 1 and signs an X to documents because he is unable to read or write. He wanted a better life for his family and he knew that meant education in the new world. Seventy-two years later, his only surviving son, who holds a doctorate, writes his legacy. This is an amazing story of love, determination, and family. 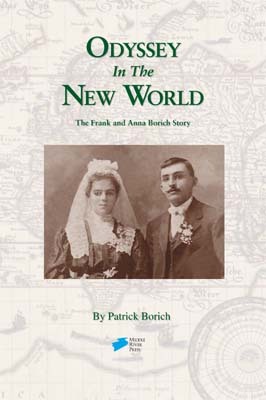 Inspired by a family reunion, the youngest son of Frank and Anna Borich researched, revisited and wrote the story of life after immigrating to America, in northern Michigan and Gary, Minnesota, and finally a farm on the rocky soil of northern Minnesota at Alborn. One hundred copies of the published book were passed out to relatives at the celebration of the author and his wife’s 50th wedding anniversary.